In a stunning acknowledgment of "who's your daddy," Microsoft has announced that the PC edition of Fable 3 will be released on Steam as well as Games for Windows Marketplace. "There can be only one," as the saying goes, and in the world of digital distribution for the PC, that's Steam, plain and simple. And while Microsoft has long tried to be the Christopher Lambert to Valve's Clancy Brown, today the software giant finally knelt down and kissed the ring. 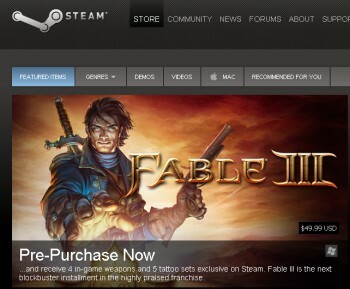 "Microsoft Game Studios and Lionhead are happy to announce that Fable 3 for Windows will be available through Valve Corporation's Steam distribution platform, in addition to Games for Windows Marketplace and in retail stores simultaneously," Microsoft announced today. Releasing a game on Steam is hardly noteworthy these days, but Microsoft turning over one of its few remaining PC franchises to the tender mercies of its arch-rival in the digital distribution arena? That's something altogether different. And I bet it stung. Microsoft is holding back a little something for itself, of course. Gamers who preorder Fable 3 on Games for Windows Marketplace will also receive a free copy of Fable: The Lost Chapters, which is a pretty sweet deal for anyone taking their first Fable plunge. A Steam preorder, on the other hand, will net you the "Rebel's Weapon and Tattoo Pack," which includes four exclusive weapons and five tattoos. So, a free game on GfW or some throwaway crap on Steam - what's it going to be, internet? Fable 3 for the PC comes out on May 17.